On several occasions, I ran into the problem of allocating work among machines of different generations with overlapping capabilities. There were several products that could be processed to the same levels of quality in both the new and the old machines. The machines worked differently. For example, the old machines would process parts in batches while the new ones supported one-piece flow. But the resulting time per part was shorter on the new machines for all products. In other words, the new machines had a higher capacity for everything. Given that the products were components going into the same assemblies, they were to be made in matching quantities per the assembly bill of materials and the demand was such that the plant had to make as many matching sets as possible. The question then is: how do you allocate the work among the machines? When I first saw this problem, I thought it was unique, but, in fact, many machine shops keep multiple generations of machines on their floors and make parts in matching sets for their customers, and it is in fact quite common. The solution that maximizes the total output is to apply the law of comparative advantage from classical economics. Adapted to this context, it says that the key is the ratio of performance between the old and the new machines on each product. For example, if the new machine can do product X 30% faster than the old machine and product Y ten times faster, then the old machine is said to have a comparative advantage on product X, and you should run as much as possible of product X on the old machine. It is a bit surprising at first, but easy to apply. What is more surprising is that so few plants do. The logic that is actually most commonly used is to load up the new machine with as much work as possible, on the grounds that it has a high depreciation and needs to “earn its keep.” What many managers have a difficult time coming to terms with is that what you paid for a machine and when you paid it is irrelevant when allocating work, because it is in the past and nothing you do will change it. You produce today with the machines you have, and the only thing that matters is what they can do, now and in the future. The law of comparative advantage is taught in economics, not manufacturing or industrial engineering, and pertains to the benefits of free trade between countries, not work allocation among machines. The similarity is not obvious. This law is attributed to David Ricardo who published in 1817, based on an analysis of the production of wine and cloth in England and Portugal. Trade was free because, at the time, Portugal was under British occupation. Both wine and cloth were cheaper to produce in Portugal, but wine was much cheaper and cloth only slightly cheaper. England had therefore a comparative advantage on cloth, and the total output of wine and cloth was maximized by specializing England on cloth and Portugal on wine. You transplant that reasoning to your machine shop by mapping the countries to machines and costs to process times. This simple approach works in a specific context. It is not general, but is of value because that context occurs in reality. The literature on operations research is full of more complicated ways to arrive at solutions in different situations. There is an article from IE Magazine in July, 2006 that I wrote about this entitled “Not-so-basic equipment: the pitfalls to avoid when allocating work among machines.” It used to be available on line for free on the magazine’s web site. Now you have to buy it on Amazon to download it. On 1/11/2011, Michael Thelen asked in the NWLEAN forum about “laws of nature” as they related to Lean. This is based on one of my answers. Lead time is a key performance indicator of manufacturing operations, but how do you measure it? It is not a quantity that you can directly observe by walking through a plant. To measure it directly you need to retrieve start and finish timestamps from historical data, assuming they are available and accurate. Or you could put tracers on a sample of parts, which means that it would take you at least six weeks to measure a six-week lead time. In most plants, however, a quick and rough estimate is more useful than a precise one that takes extensive time and effort to achieve. That is where work sampling and Little’s Law come in handy. The key idea of work sampling, which the Wikipedia article fails to make clear, is that lets you infer a breakdown of each entity’s status over time from snapshots of the status of multiple identical entities. If, every time you go to the shop floor, you see 2 out of 10 operators walking the aisle, you infer that, on the average, each operator spends 20% of the time walking the aisle. There are obviously necessary conditions for such an inference to be valid. For example, you want to take snapshots during normal operations, not during startup orshutdown, and the group you are measuring must be homogeneous: if it is comprised of two materials handlers and eight production operators, the 20% average is not interesting, even if it is accurate. Work sampling is usually described as applied to people, but the same logic is applicable to machines and to work pieces, and that is what makes it possible to infer lead times from snapshots of inventory and throughput rates. On the shop floor, you can count parts, bins or pallets, and observe the pace at which they are being consumed. Let us assume we are in the context shown in Figure 1, and want to estimate how long we take to turn a blank into a finished good. The reason this is true is best explained graphically, as in Figure 2, in the simple case of constant throughput and lead time. The cumulative count of blanks in is a straight line going up over time, and so is the count of finished goods out, offset by the lead time. The vertical distance between the curves is the number of blanks that have come in but not yet made it out as products, and represents therefore the inventory. 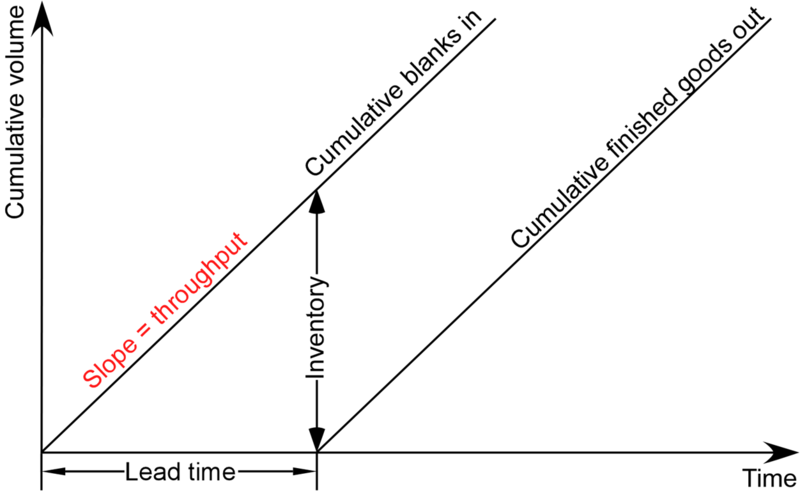 The slope of each curve is the throughput, and it is clearly the ratio of the inventory to the lead time. What is interesting about Little’s Law is that it remains valid about averages when both rates of arrivals of blanks and departures of finished goods are allowed to fluctuate randomly about an average. This is probably the best known and most useful general result of queueing theory. Since we can count inventory and measure throughput, we can infer average lead times from just this data. One snapshot will not give you an accurate estimate, but it is still considerably easier to take a few snapshots of a production line to get a more accurate estimate than it is to research history. The point is to get close to an answer that would take much longer to get if you actually had to be accurate.